This Indian-Tikka Masala inspired grilled cheese sandwich is passport to a mouthwatering and spicy trip to India without leaving your own kitchen. It delivers bold, sweet and spicy flavor with buttery masala sauce, sautéed onions, unique duo of rich Asiago and Havarti Cheeses, chicken with kick of cayenne and surprise of sweet tropical lychees. I promised to share a few delicious, foodie memories of our last month Vegas trip. 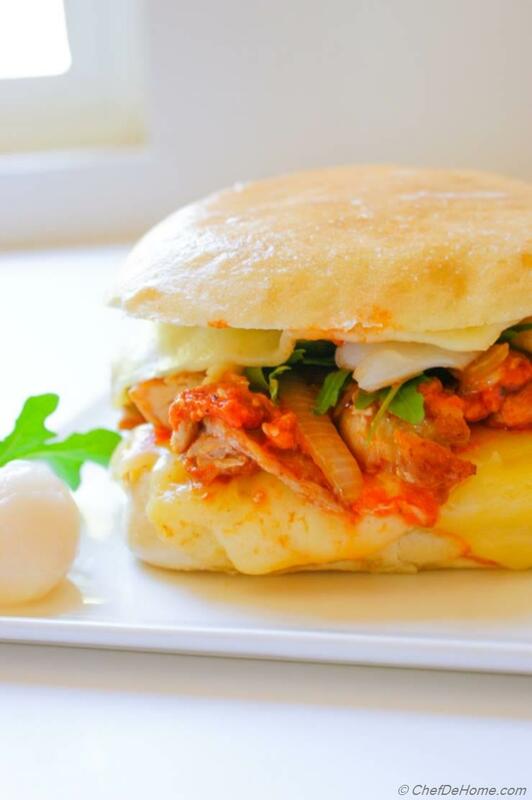 Starting with this mouthwatering, Indian Spiced chicken sandwich. I know!! Rolling eyes? Same here!! , "What are Indian spices doing in Vegas??" True!! I was equally surprised when I ate Curry Chicken Cheese Sandwich in Jean Philippe Patisserie in Aria. Every person in the line that day was ordering this sandwich and so did Vishal. Believe me, we loved it! 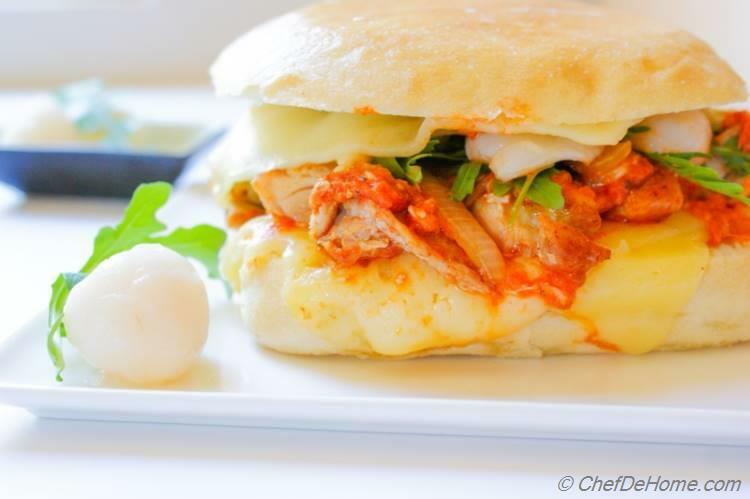 So aromatic and full of flavor, the curry spiced chicken cheese sandwich with yogurt dressing was unbelievable in taste! Being born and brought up with spices all over me ;) I know a curry taste and Jean Phillppe's hit the right nodes!! My today's Grilled Cheese Chicken Sandwich is inspired from that yet a very different version. If you like Chicken Tikka Masala and Grilled Cheese (who doesn't? I guess!! ), then you will adore this grilled cheese sandwich. Even though I would like to try making Curry Chicken Sandwich, exactly like Jean Philippe sometime, but today is Tikka Masala Day! 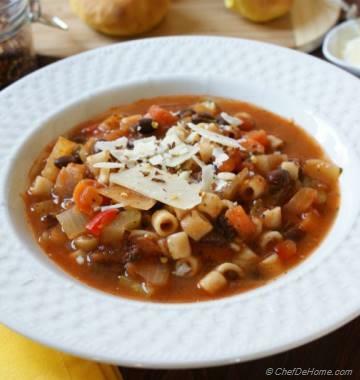 You can make it at home in just 25 minutes from kitchen to dinner table! And taste? 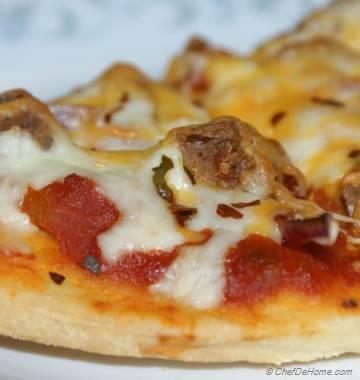 I bet, you will be making it the VERY next day again and thanking me for such an easy and scrumptious recipe. 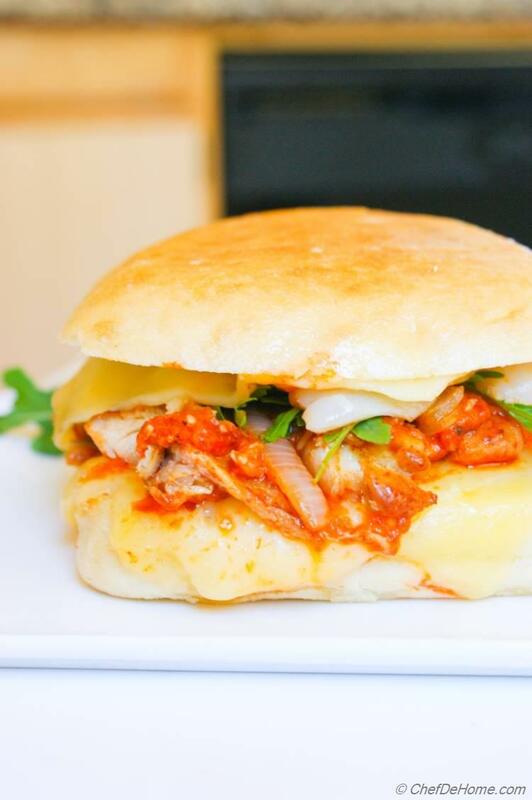 Every bite of this sandwich had complex flavors.... chicken coated in sweet and spicy masala sauce with buttery asiago cheese, crunchy grilled ciabatta bread, peppery arugula and then burst of sweet tropical lychee nuts and hint of garam masala.... do I need to say anything else?? 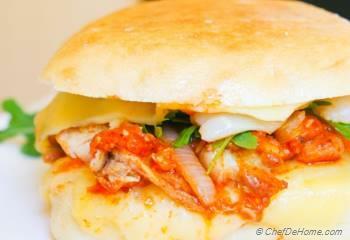 This Sandwich has word "scrumptious" written all over it!! Look no further! 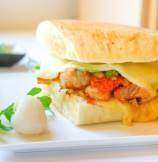 Make chicken grilled cheese sandwich (with spicy masala twist) and Bon Appetite!! Smart Swap In hurry? Make Masalawich with Indian Tikka Masala Leftovers. 1. Coat bottom of medium, nonstick skillet with 1 tsp butter. 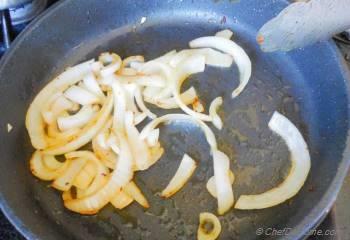 Saute sliced onion 2-3 minutes, until softened and slightly browned. Remove onion in a plate and set aside. 2. In same skillet, add more 1 tbsp butter, add garam masala and let it perfume butter for 30 secs, then add tomato sauce, honey, 1/4 tsp cayenne. Simmer for 4 min. Mix in heavy cream and grated Asiago cheese. Remove from heat. Set aside. Don't use honey if tomato sauce you using is pre-sweetened. 3. Place two slice of Havarti Cheese over bottom half of Ciabatta Roll. 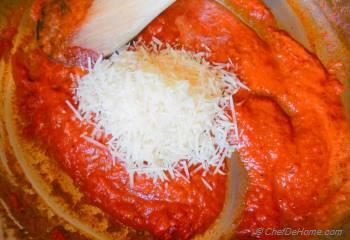 Spread 1 tbsp tomato sauce mixture over cheese. Arrange rotisserie chicken pieces in an even layer. Now top it with remaining Asiago-Tomato sauce, evenly dividing. Top sauce with onion slices, arugula then followed by lychee fruit pieces in an even layer, then top with remaining 2 slices of Havarti followed by bread slice. 4. In a large nonstick skillet, melt 2-3 tablespoons butter over medium heat. Place sandwiches in skillet and spread remaining butter over sandwich tops. 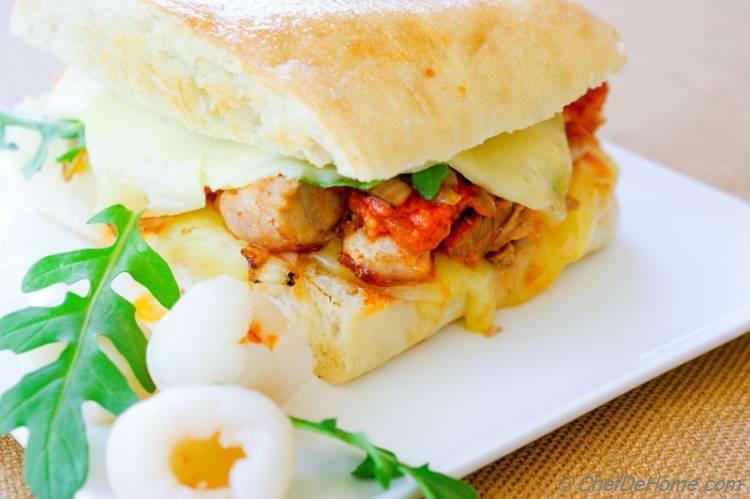 Cook sandwiches until bottom bread is golden brown and crispy, about 3 minutes. Using a wide spatula, carefully flip sandwiches, pressing down gently. Continue cooking additional 3 minutes, or until both sides are golden brown and crispy, add filling is warm and melted. Masala sauce will stay good in refrigerator 2-3 days and in-fact will taste better after a day. You can use rotisserie or baked or grilled chicken for this sandwich. 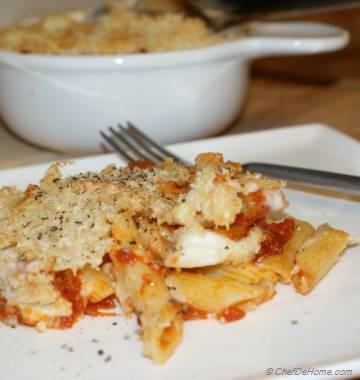 If can't find Asiago, use Parmesan. Also, you can use Swiss Cheese in-place of Havarti.